In the relatively few years since the advent of a new millennium, contemporary painting has witnessed a surprising number of shifts and tendencies. From a brief flirtation with academic figuratism to Modernist homage, renewed engagement with abstraction and, latterly, investigations of the painterly platform itself, these mutations are, in fact, eminently logical: essentially a whirlwind, chronological trawl through key aspects of the discipline's own history, achievements and concerns. Exceptions do, of course, exist, such as the work of Takashi Murakami, whose evolution towards an (almost) entirely digital production we'll touch upon later. 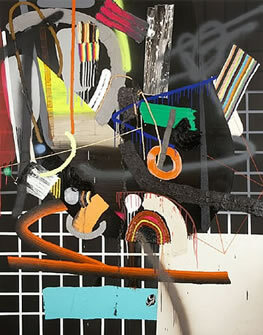 And it's likewise true that, for a period from the mid-1990s to the early noughties, artists such as Sarah Morris, Matthew Ritchie, Ian Monroe (above) and Torben Giehler (below) seemed to be defining similarly 'future-forward' positions with painting that self-evidently owed its sense of space to Photoshop, Illustrator or CAD, while still chiming with a resurgence of interest in Modernist geometric abstraction. These artists remain respected figures, but their influence on a new generation of far more painterly painters seems negligible. Which raises the question as to how fully computer technology has actually infiltrated one of the most traditional artistic disciplines - and whether painting is still looking towards the past rather than attempting to shape a specifically 21st century vocabulary. The answer, in fact, is that evidence of digital assimilation in current practice is absolutely manifest, just far more subtle than we might expect it to be. It pervades the canvas primarily through reference to the tools and effects commonly found in even the most basic digital painting packages. 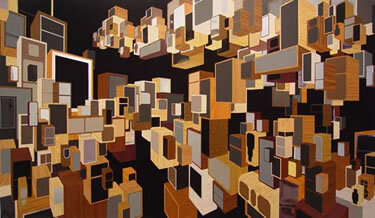 "(My) paintings are made with acrylic, Flashe, One-Shot enamel, spray paint and oil paint. Each of these materials creates a very different kind of mark as well as a different surface quality.... Also, my very first abstract paintings were made as a child on an ancient black and white Mac with Microsoft Paint's built-in tools: the pencil, the paintbrush, the spray can, the fill bucket, and the gradient." Benson's experience and subsequent references are, we suggest, far from isolated, making for a digital assimilation more extensive and holistic than we might once have imagined. For a generation of painters that has grown up in the grip of now-not-so-new technology, its real impact seems to announce itself in tropes and gestures heavily influenced by software's own replications of traditional painting processes. This - although it may not seem immediately obvious - is the age of painting as filtered through Photoshop's filters. 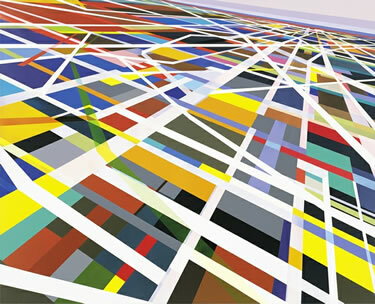 The sheer abundance and diversity of imagery available online is a phenomenon mediated in the work of painters such as Wilhelm Sasnal and many others besides. The issue of the contemporary valency of image in an era of visual saturation is, generally speaking, reflected in subject matter rather than style, and won't be dealt with here. Beautiful Inside My Bank Account Forever?